Out with the old and ring in the new!!! While 2013 held some decent and happy times for our family, it also held it’s share of deep and tragic heartache. I for one, am not sad to see it in the rear view mirror as we travel on life’s highway. I excitedly look forward to the year 2014 with great hope and optimism. The promise of a fresh new start is always very uplifting and refreshing with the thought that anything and everything good is just around the corner waiting to happen. -Add the first three ingredients to Champagne glasses and top off with orange juice. -Best served cold and with the people you love most in the world! Dream big! Live big! Laugh big! Love big! This is my toast to you for the coming new year and one that I hope to make good on for myself 🙂 HAPPY NEW YEAR!!! A big THANK YOU goes out to Constance of The Foodie Army Wife for hosting this week’s #SundaySupper theme ~ Reflections and Resolutions. To see all the other participants for this weeks #SundaySupper, please click on the links below. I just know you’ll enjoy them! "Dream big! Live big! Laugh big! Love big!" Wonderful toast! 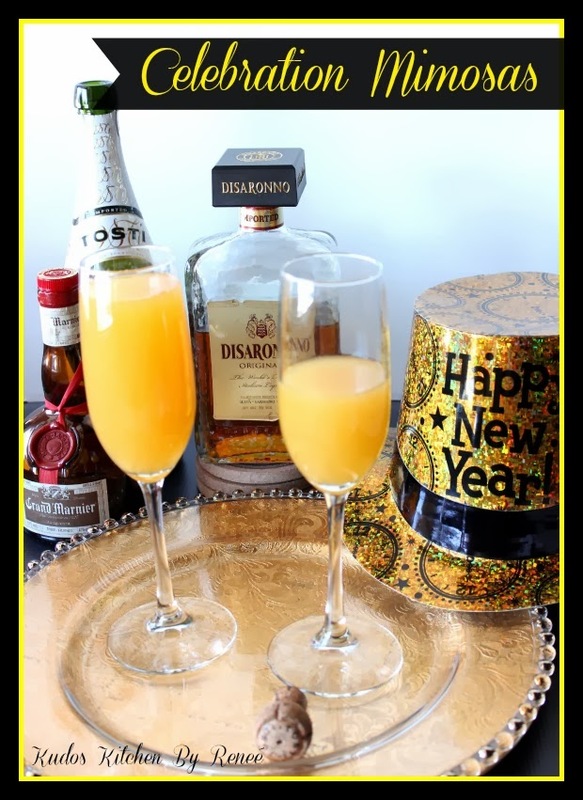 These mimosas are a great way to ring in the new year! Happy New Year! Thank you, Dorothy! Happy New Year! Thanks so much Constance. Same to you!!! Cheers to you Renee and I hope the coming year will bring you much happiness and success. I like how you think! Dream big! Live big! Laugh big! Love big! It has been wonderful getting to know you through your #SundaySupper recipes. Thank you for being part of the #SundaySupper family. Looking forward to 2014~ I hope we have the opportunity to meet IRL! Love that you added Amaretto to the mimosa. Great idea! Cheers to 2014! I feel the same Isabel! Thanks so much! Ditto right back to you, Renee! I've never added Amaretto to my Mimosas, but it sounds like an amazing twist! We had a few heartaches in 2013…so looking forward to 2014. Wishing you a joyous New Year, Renee! I like your switch on mimosas, Renee. I hope your 2014 exceeds all your expectations! I suppose every year has it's fair share of heartaches but this year packed a one-two punch. I wish you the best of everything in 2014, Liz. Love the addition of Grand Marnier to these mimosas! Great idea! 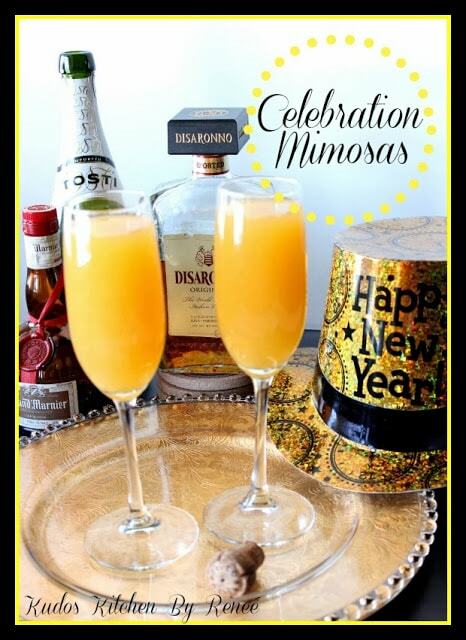 These are truly celebration Mimosa's and look perfect to toast to the New Year. Wishing you and your family a happy, healthy, and successful 2014! Wow, I love this twist on a mimosa!! Grand Marnier AND Amaretto. They would be fabulous on New Year's Eve!! Have a great 2014! I love the addition of Grand Marnier and Amaretto! Cheers to great things for you in 2014! Great outlook for the new year! I love mimosas! I have them every year for Christmas!! Happy New Years to you and your family!! I love your toast Renee and I love the sound of these Mimosas! I do hope that you try throughout 2014 to remember your toast and to live it as best you can. All the best to you and your family. Happy New Year! Mmmm! Love a good Mimosa (though I've been know to leave out the juice when I have Champy – I used Cava or Prosecco instead when adding juice) Great recipe! Happy New Year Renee!